Forget The 50 States; The U.S. Is Really 11 Nations, Author Says Author Colin Woodard says it's better to think of the U.S. as 11 distinct nations instead of 50 states. He speaks with Tell Me More about how those nations came about, and why they play a role in everything from gun control to tax policy. Colin Woodard's map of the "11 nations." For hundreds of years, this nation has been known as the United States of America. But according to author and journalist Colin Woodard, the country is neither united, nor made up of 50 states. 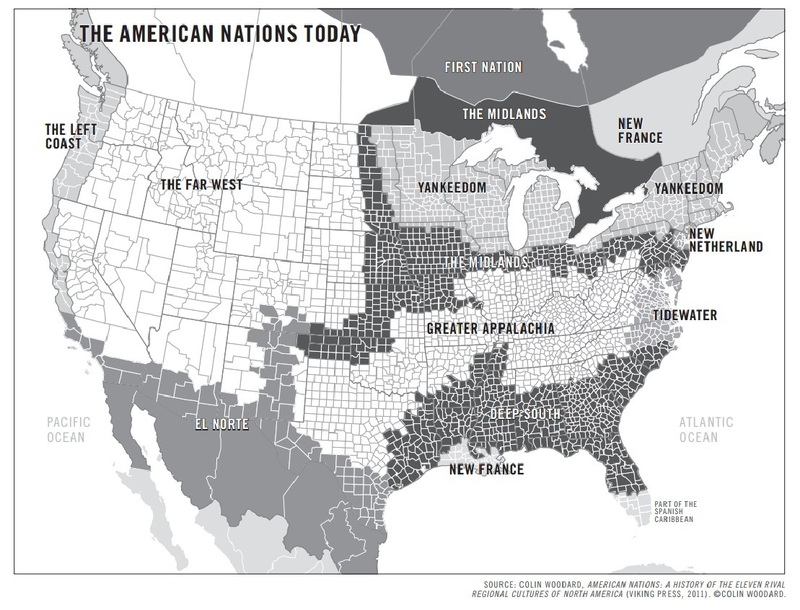 Woodward has studied American voting patterns, demographics and public opinion polls going back to the days of the first settlers, and says that his research shows America is really made up of 11 different nations. "Yankeedom" in the Northeast and industrial Midwest was founded by Puritans and residents there have always been comfortable with a government that regulates and moderates. The communities of the Deep South in Mississippi, Alabama, Georgia and other states were founded by former West Indian plantation owners who wanted to recreate the society they were used to: government based on the sacrosanct rights of a few wealthy elite. "Greater Appalachia," extending from West Virginia in a wide band to the northern half of Texas, was settled by people from Northern Ireland, England and Scotland. Those people were openly antagonistic to the so-called "ruling oligarchies" and upper classes, so they opposed the slave plantation economy, but they also distrust government. Woodard says that while individual residents will have their own opinions, each region has become more segregated by ideology in recent years. In fact, he says the mobility of American citizens has increased this partisan isolation as people tend to self-segregate into like-minded communities. "This isn't about individual behavior, it's about the characteristics of the dominant cultures of these various regions. And you can, as an individual, like or hate the sort of surrounding assumptions where you live," Woodard says. "But that force that you feel that's there, and those sort of assumptions and givens about politics, and culture, and different social relationships — that's the forces of dominant culture that go back to the early colonial period, and the differences between various colonial clusters and their founders." Washington Post: Which of the 11 American nations do you live in?